Human Rights Watch has called on Turkey to stop firing on Syrian civilians fleeing fighting and allow them to cross the Turkish border. The UN Refugee Agency asked Ankara to provide data on possible refugee deaths in shelling on the Syrian border. “As civilians flee ISIS fighters, Turkey is responding with live ammunition instead of compassion,” Gerry Simpson, senior refugee researcher at HRW, said in a statement. “The whole world is talking about fighting ISIS, and yet those most at risk of becoming victims of its horrific abuses are trapped on the wrong side of a concrete wall,” he added. A new wave of refugees has fled northern Syria for the Turkish border after Islamic State (IS, formerly ISIS/ISIL) opened fire on communities that had sheltered them. Three people were killed and thousands more were uprooted, the Guardian reported. Renewed fighting between IS and armed opposition groups in Northern Aleppo has displaced at least 30,000 people in the past 48 hours, HRW said. According to international aid workers in Turkey and heads of six of the 10 displaced persons camps east of Azaz near the Turkish border, IS advances on Wednesday and Thursday forced out at least half the camps’ 60,000 residents. They have fled to other camps, such as the Bab al-Salameh on the Turkish border and to the nearby town of Azaz. Three of the camps (Ikdah, Harameen and al-Sham) are now deserted. There used to be around 24,000 people sheltering there, according to HRW. The human rights watchdog highlighted that Turkey’s border still remains “firmly shut” a year after the authorities started rejecting all but the most seriously injured Syrians. On Thursday, HRW spoke with representatives of six of the 10 camps and seven displaced Syrians, who had been living in camps that had been taken over by IS, or that were close to the fast-changing IS front line. All the residents said they wanted to get to Turkey, but the closed border meant they had no escape. Some said they had stayed in camps threatened by IS because they were afraid they wouldn’t be able to find shelter elsewhere. They knew other camps along the Turkish border were completely full. Others said they had returned to their nearby home villages even though they are still unsafe. The head of Ikdah camp, on the Turkish border, said that IS had taken over the camp, which sheltered just under 10,000 people, early on April 14. The militants fired shots in the air and told the residents to leave. “At dawn we heard gunshots near the camp. A short while later ISIS arrived and used a loudspeaker to tell us we all had to leave. They said we had nothing to fear and that we should all go east, into ISIS territory. 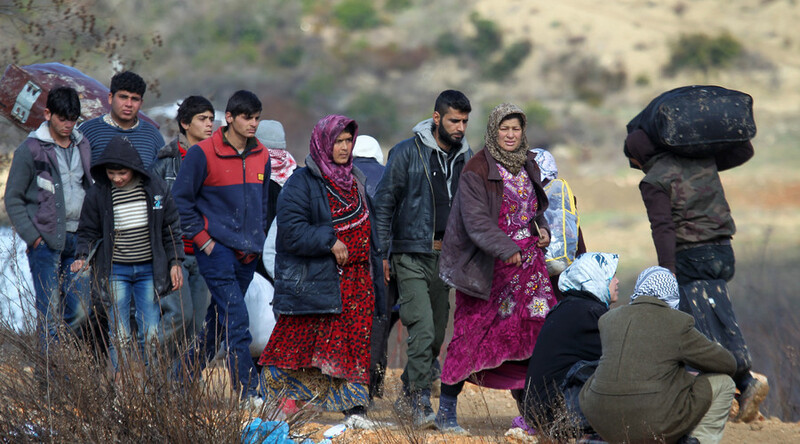 We left the camp but headed north through olive groves toward the Turkish border," one camp resident told HRW. “We were about 2,000 people. As we approached the border wall we saw Turkish soldiers on a hill behind the wall and they just started shooting at us. They shot at our feet and everyone just turned round and ran in all directions. I took my family and we walked to another [displaced persons] camp nearby, called al-Rayan. We’re afraid now because ISIS is close to this camp too. But where can we go,” he added. Europe continues to face the most severe refugee crisis since World War II. Over a million migrants arrived in the continent in 2015. Most are from Syria, where 250,000 people have been killed and over 12 million displaced since the civil war broke out in 2011, according to UN figures. EU leaders and Turkey have recently agreed a plan, aimed at opening a "safe and legal" route to the EU for Syrian refugees. Under the deal, sealed on March 20, Ankara is supposed to take back all migrants and refugees, including Syrians, who cross the Aegean Sea to enter Greece illegally. In return, the EU takes in thousands of Syrian refugees directly from Turkey, rewarding Ankara with an early visa-free travel regime, advancement in EU membership talks and - last but not least - more money. The Turkish president warned last week that Turkey won’t take back Syrian refugees if the EU doesn’t fulfill its promises. 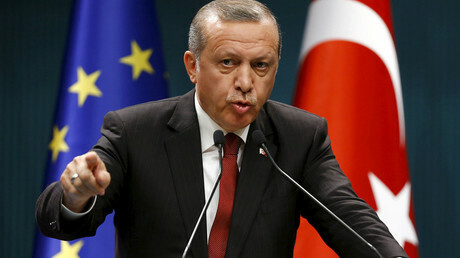 Recep Tayyip Erdogan was said to have threatened flooding the European Union with migrants should Ankara not be offered enough cash to help curb the influx primarily from the Middle East. Amnesty International said last week that Turkey has forcibly returned thousands of Syrian refugees to their war-torn country since mid-January. Around 100 Syrians are expelled from Turkey every day, according to research by Amnesty International. Many Syrians are not registered in Turkey. The tightened border restrictions and new visa requirements for Syrians have prompted many to resort to people smugglers, who charge an average of US$1,000 per crossing, the rights advocacy group says. They also maintain there are “fatal flaws” in the Ankara-EU deal. “I don’t think that this kind of deal can work,” the Independent Journalists Association for Peace’s Joaquin Flores told RT earlier this month.